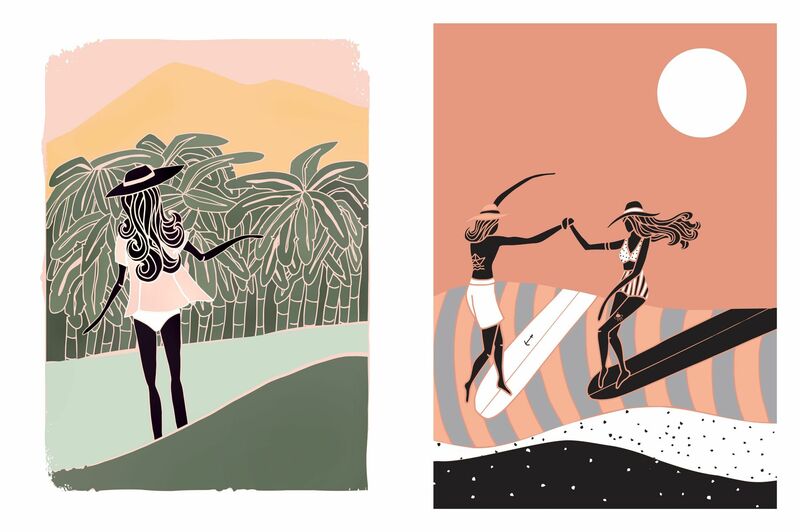 I found Lizzy’s beautiful illustrations while looking for some surf related artworks for my daughter’s bedroom. We live at the beach and love the ocean. So I thought it would be a great idea to have an artwork reflecting that on my daughter’s wall. While browsing some surf related hashtags on Instagram I found Lizzy. And I’m really glad I did! Besides finding the perfect artwork for my daughter’s room, I also fell in love with her work. I started to follow her and got to admire the artist even more. Not only she is a super talented and creative person, but you can really feel her love for the ocean and for surfing in her pieces. Her illustrations are beautiful and are filled with style. Oh the style. She captures all the coolness of long boarders and puts it all on her pieces. Lizzy calls her art Soul & Surf illustration. And I totally agree. Her pieces have a Bohemian vibe that all ocean lovers will understand and love. You can really see her passion for the ocean in her work. And as Lizzy says, the ocean is her master. That relationship is clear on her work. From hang tens to chilling by the beach. From casual surfing to resting in a hammock. Lizzy’s illustrations are simply fantastic. You better put your Beach Boys soundtrack on and take your time to enjoy these images. And make sure to visit the artist’s website for more. Im Portuguese surfer girl living by the sea in Peniche, Portugal. Since 2013 I’m developing some illustration work inspired in my simple life by the Ocean, and what it represents for me. I see surf as a way for spiritual and self improvement, and the Ocean my great master. The ocean teaches me, and what I draw is a consequence of what I learned from it. Drawing is my way of sharing my truths. I like to call my art “Soul & Surf” illustration. A mix of Bohemian inspirations, ethnical colors and patterns, mandalas, american indian representations, feathers, birds, eyes, geometric figures, retro surf iconography and the classic surf movements are my main representations.